Just for fun (before you say it, I know I need to get out more) I decided to do a little number crunching with the statistics for the ability to speak Welsh fluently, speak Welsh but not fluently, and not speak Welsh at all in primary and secondary schools. The raw data can be found here and here. The figures come with a huge health warning. They are based on parents' assessment of their children's ability. This is therefore quite subjective and, in particular, will vary from area to area. That should be obvious by comparing Sir Gâr with Monmouthshire: only 6.8% of Monmouthshire parents think their secondary school age children cannot speak Welsh, whereas 36.4% of Sir Gâr parents think the same thing. This is probably because so few parents in Monmouthshire speak Welsh that they are quite likely to think speaking only a few words equates with an ability to speak the language. That would seem to be confirmed in the Language Use Surveys, as mentioned here. The second complication is that the figures are only available back to 2004/05 so it's not yet possible to compare the same set of children as they progress from primary to secondary school. • In only two authorities do children make significant progress from being able to speak Welsh to being able to speak Welsh fluently: Ynys Môn and Ceredigion. Torfaen and RCT also put in good performances, but Torfaen's figures are distorted by Gwynllyw being the only WM secondary for neighbouring authorities. • A good number of authorities show a significant improvement in ability to speak Welsh, though not necesarily fluently. Conwy, Vale of Glamorgan and Blaenau Gwent are in the top bracket (greater than 30% improvement) with Ynys Môn, Denbighshire, Swansea, Caerffili and Torfaen in the next bracket. The implication would seem to be that the other authorities are not teaching Welsh in their secondary schools anywhere near as well as they could or should. Powys, Newport and Wrexham are particularly disappointing. RCT is strange in that it seems to make a good job of getting children that can already speak Welsh to progress towards fluency, but manages to leave those who cannot speak Welsh at all no better off than they were in primary school. I'd emphasize that I'm not presenting these figures as proof of anything. At most they indicate trends that might help us to gain a better insight into what is happening in different parts of Wales. As much as these figures don't 'prove' anything, I think it's extremely worrying that only in one local authority in these figures contains a majority who are considered fluent in primary school. 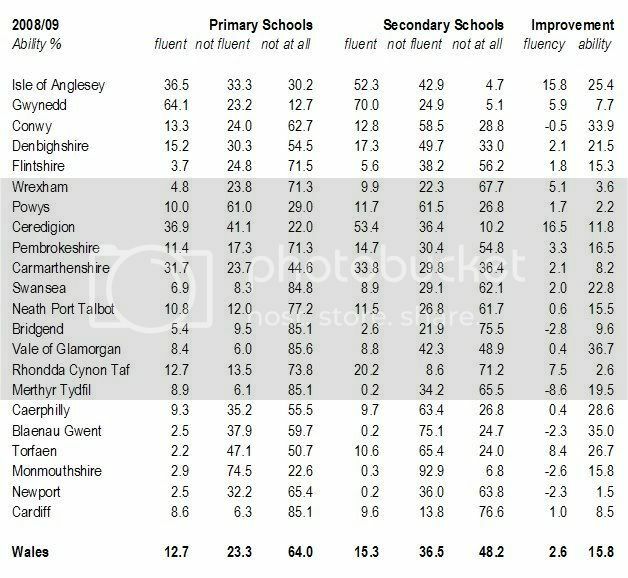 The 'not at all fluent' figures for Carmarthenshire, primary and secondary, are also pretty disappointing. I'm probably more concerned about Carmarthenshire's policies and performance on WM education than anywhere else. Most primary education is WM, and there is a large parental demand for more WM education in the pocket around Llanelli that is finally being addressed, though much too slowly. And Carmarthenshire is particularly bad the in transfer from primary to secondary education, which is mainly EM. But I would never try and put any of the blame for the decline on the "laziness" of Welsh speaking parents, Anon. A generation or two ago it was true that Welsh speaking parents didn't pass on the language when they could have, but I would say it was nearly always done in the sincere belief that the choice not to do so was in the best interests of their children. There was a general sense of hopelessness about Welsh and the prospects for Wales a few decades ago resulting in the feeling that the only way for children to get on was to get out. That has now changed. The parental will for their children to regain what they themselves had lost for a generation is most certainly there. Let's build on that, rather than recriminate.